There is no scholarly agreement on the appearance of Jesus; over the centuries, he has been depicted in a multitude of ways. The race and appearance of Jesus has been a topic of discussion since the days of early Christianity. There are no firsthand accounts of Jesus's physical appearance, although the New Testament describes Jesus wearing tzitzit - the tassels on a tallit - in Matthew 14:36 and Luke 8:43-44. Revelation 1:14-16 symbolically describe Jesus as having hair as white as wool, eyes like blazing fire, and from his mouth came a two edged sword. His feet like bronze/brass, as if refined in a furnace, and His face was shining like the sun in all its brilliance. Jesus probably looked like a typical Judean man of his time. Research on ancient skeletons in Israel suggests that Judeans of the time were biologically closer to Iraqi Jews than any other contemporary population, and thus in terms of physical appearance the average Judean of the time would have likely had dark brown to black hair, olive skin, and brown eyes. Judean men of the time period were on average about 5 feet 5 inches (1.65 m) in height. Scholars have also suggested that it is likely Jesus had short hair and a trim beard, in accordance with Jewish practices of the time. The earliest depictions of Jesus from the Roman catacombs depict him as free of facial hair. Historians have speculated over how Jesus' ascetic and itinerant lifestyle and work as a carpenter, with the manual labor and exposure to the elements that entailed, affected his appearance. It has been suggested that Jesus likely had a sinewy appearance. He may have had weathered and callused skin and a leathery face, and looked older than he really was. It has even been suggested that due to the high risk of injury of the job, he may have had some type of disfigurement. Old Testament references interpreted by Christians as being about a coming messiah have been projected forward to form conjectures about the appearance of Jesus on theological, rather than historical, grounds; Isaiah 53:2 which refers to the scourged Messiah with "no beauty that we should desire him" and Psalm 45:2–3 which describes him as "fairer than the children of men", often interpreted as his physical description. Clarke's Commentary accepts Lamentations 4:7 (KJV) "Her Nazarites were purer than snow, they were whiter than milk, they were more ruddy in body than rubies, their polishing was of sapphire. The Synoptic Gospels include the account of the Transfiguration of Jesus, during which he was glorified with "His face shining as the sun." but this appearance is considered to refer to Jesus in unearthly form. The Book of Revelation includes John's vision of the Son of Man: "His head and his hairs were white like wool, as white as snow; and his eyes were as a flame of fire; And his feet like unto fine brass [other translations: "burnished bronze"], as if they burned in a furnace..." and “from his mouth came a two edged sword. His face was shining like the sun in all its brilliance”, in a vision (1:14–16), but this vision is usually considered to refer to Jesus in heavenly form, not necessarily his appearance during his earthly life. Despite the lack of direct biblical or historical references, from the 2nd century onward various theories about the appearance of Jesus were advanced, but early on these focused more on his physical appearance than on race or ancestry. Larger arguments of this kind have been debated for centuries. Justin Martyr argued for the genealogy of Jesus in the biological Davidic line from Mary, as well as from his non-biological father Joseph. But this only implies a general Jewish ancestry, acknowledged generally by authors. The focus of many early sources was on Jesus's physical unattractiveness rather than his beauty. The 2nd century anti-Christian philosopher Celsus wrote that Jesus was "ugly and small" and similar descriptions are presented in a number of other sources as discussed extensively by Eisler, who in turn often quotes from Dobschütz' monumental Christusbilder. Tertullian states that Jesus's outward form was despised, that he had an ignoble appearance and the slander he suffered proved the 'abject condition' of his body. According to Irenaeus he was a weak and inglorious man and in The Acts of Peter he is described as small and ugly to the ignorant. :439 Andrew of Crete relates that Christ was bent or even crooked:412 and in The Acts of John he is described as bald-headed and small with no good looks. As quoted by Eisler,:393–394, 414–415 both Hierosolymitanus and John of Damascus claim that "the Jew Josephus" described Jesus as having had connate eyebrows with goodly eyes and being long-faced, crooked and well-grown. In a letter of certain bishops to the Emperor Theophilus, Jesus's height is described as three cubits (four feet six), which was also the opinion of Ephrem Syrus (320–379 AD), "God took human form and appeared in the form of three human ells (cubits); he came down to us small of stature." Theodore of Mopsuhestia likewise claimed that the appearance of Christ was smaller than that of the children of Jacob (Israel). In the apocryphal Lentulus letter (see below) Jesus is described as having had a reddish complexion, matching Muslim traditions in this respect. Jesus's prediction that he would be taunted "Physician, heal yourself" may suggest that Jesus was indeed physically deformed ('crooked' or hunch-backed) as claimed in the early Christian texts listed above. In fact, Justin Martyr, Tertullian, and Ambrose actually considered lack of physical attractiveness in Jesus as fulfilling the Messianic prophecy "Suffering Servant" narrative of Isaiah 53. But, the more mainstream theological perspective, as expressed by Church Fathers Saint Jerome and Saint Augustine of Hippo, argued that Jesus must have been ideally beautiful in face and body. For Augustine he was "beautiful as a child, beautiful on earth, beautiful in heaven". These theological arguments were further extended in the 13th century by Saint Thomas Aquinas in his Summa Theologiae based on his analysis of the Perfection of Christ, reasoning that Jesus must have embodied every possible human perfection. By the Middle Ages a number of documents, generally of unknown or questionable origin, had been composed and were circulating with details of the appearance of Jesus, as described below. Around the 9th century, Epiphanius Monachus referred to a tall angelic figure, which has at times been interpreted as Christ, but scholars consider it an unlikely reference to Jesus. Other spurious references include the Archko Volume and the letter of Pontius Pilate to Tiberius Caesar, the descriptions in which were most likely composed in the Middle Ages. A forged letter by Publius Lentulus, the Governor of Judea, to the Roman Senate dates to around the year 1300 and, according to most scholars, was composed to compensate for the lack of any physical description of Jesus in the Bible. Also in the 14th century Nicephorus Callistus quoted an unnamed antique source that described Jesus as tall and beautiful with fair, wavy hair, but his account was most likely without basis and was inspired by the prevailing artistic images of Jesus. Quranic and hadith traditions such as Sahih Bukhari as well as tafsir have given an oral depiction of what Jesus looked like, although some accounts do not match, such as Jesus being both curly haired and straight-haired. The hadith refer to Muhammad's account of the Night Journey, when he is supposed to have been taken up to heaven by the angel Gabriel (Jibra'il), where he saw Jesus and other prophets. Most versions of this say that "Jesus had curly hair and a reddish complexion". Others say his face was flushed as if he just had a bath ("a reddish man with many freckles on his face as if he had just come from a bath"). In another account from Bukhari Jesus is seen in a dream near the Kaaba, as "a man of a wheatish complexion with straight hair. I asked who it was. They said: This is the Messiah, son of Mary". However, other narrations give variations in the color. Salim ibn Abd-Allah reports from his father Abdullah ibn Umar that the prophet "did not say that Jesus was of red complexion", rather he was "a man of brown complexion and lank hair". In contrast Abd Allah ibn Abbas says that Jesus was of "moderate complexion inclined to the red and white colors and of lank hair." According to Hanafi Madhab contradictions in hadith may be resolved through multiple methods, one being the number of times a narration has been made and the number of chain of narrations and the character of those in the chain of narration or the narrator him or herself. There are four hadiths in Bukhari stating Jesus had a brown complexion and three hadiths in Imam Muslim. However, the most prominent narrator is from Salim ibn Abdullah ibn Umar, descendent of Caliph Umar, with a chain of narration that stated: "a man of brown complexion and lank hair". These variations have been explained in various ways, and have been co-opted to make assertions about race. For example, Ana Echevarría notes that medieval Spanish writer Jiménez de Rada in his Historia arabum chooses a version to emphasise that Jesus is whiter than Muhammad, quoting the Ibn Abbas version: "I saw Jesus, a man of medium height and moderate complexion inclined to the red and white colours and of lank hair". Echevarría comments that "Moses and Jesus are portrayed as specimens of a completely different 'ethnic type', fair and blond; 'ethnic' or 'racial' differences between them and Muhammad are thus highlighted." More references needed to prove ethnic/racial difference, none of the hadith state anything about racial difference of Moses has never been made in the Qura'n or hadith. Furthermore, most accounts of hadith state that Moses was of dark complexion, i.e. Sahih Bukhari Volume 4, Book 55, Number 607, Sahih Bukhari Volume 4, Book 55, Number 648, Sahih Bukhari Volume 4, Book 55, Number 650. There is almost universal agreement that Moses was of dark complexion by 6th century Hijazi standards. As the biological son of David, Jesus would be of the Jewish race, ethnicity, nation, and culture. One argument against this would be a contradiction in Jesus' genealogies: Matthew saying he is the son of Solomon and Luke saying he is the son of Nathan - Solomon and Nathan being brothers. John of Damascus taught that there is no contradiction, for Nathan wed Solomon's wife after Solomon died in accordance with scripture, namely, yibbum (the mitzvah that a man must marry his brother's childless widow). In his book Racializing Jesus, Shawn Kelley states that the assignment of a specific race to Jesus has been a cultural phenomenon emanating from the higher levels of intellectual circles within societies, and he draws parallels between the seemingly different approaches within different settings. Cain Hope Felder has argued that New Testament passages such as Galatians 3:28 express a universalism that goes beyond race, ethnicity or even religion. The English writer Godfrey Higgins suggested in his book Anacalypsis (1836) that Jesus was a dark brown skinned Indo-Aryan from North India. In 1906 a German writer named Theodor Plange wrote a book titled Christ-an Indian? in which he argued that Jesus was an Indian and that the Christian gospel had originated in India. By the 20th century, theories had also been proposed that Jesus was black, but not necessarily a descendant of any specific black African ethnicity, e.g. based on the argument that the ancient Israelites, as a group, were in whole or part originally a black people. :43–50 Martin Luther King was a proponent of the "Black Christ" movement and identified the struggle of Jesus against the authorities of the time with the struggle of African Americans in the southern parts of the United States, as he questioned why the white church leaders did not voice concern for racial equality. For some, this blackness was due to Jesus's identification with black people, not the color of his skin, while others such as Albert Cleage argued that Jesus was ethnically black. A study on the 2001 BBC series Son of God attempted to determine what Jesus's race and appearance may have been. Assuming Jesus to be a Galilean Semite, the study concluded in conjunction with Mark Goodacre that his skin would have been "olive-coloured" and "swarthy"—these results were criticised by some media outlets for being "dismissive" and "dumbed down". However, this type of analysis suggests, that even though Caucasian, Jesus may not have fit into all modern definitions of whiteness in the Western world. In academic studies, beyond generally agreeing that "Jesus was Jewish", there are no contemporary depictions of Jesus that can be used to determine his appearance. It is argued that Jesus was of Middle Eastern descent because of the geographic location of the events described in the Gospels, and, among some modern Christian scholars, the genealogy ascribed to him. For this reason, he has been portrayed as an olive-skinned individual typical of the Levant region. In 2001, a new attempt was made to discover what the true race and face of Jesus might have been, and documented in the Son of God documentary series. The study, sponsored by the BBC, France 3 and Discovery Channel, used one of three 1st-century Jewish skulls from a leading department of forensic science in Israel. A face was constructed using forensic anthropology by Richard Neave, a retired medical artist from the Unit of Art in Medicine at the University of Manchester. The face that Neave constructed suggested that Jesus would have had a broad face and large nose, and differed significantly from the traditional depictions of Jesus in renaissance art. Additional information about Jesus's skin color and hair was provided by Mark Goodacre, a senior lecturer at the Department of Theology and Religion at the University of Birmingham. Using 3rd-century images from a synagogue—the earliest pictures of Jewish people—Goodacre proposed that Jesus's skin color would have been darker and swarthier than his traditional Western image. He also suggested that he would have had short, curly hair and a short cropped beard. This is also confirmed in the First Epistle to the Corinthians, where Paul the Apostle states that it is "disgraceful" for a man to have long hair. As Paul allegedly knew many of the disciples and members of Jesus's family, it is unlikely that he would have written such a thing had Jesus had long hair. Although not literally the face of Jesus, the result of the study determined that Jesus's skin would have been more olive-colored than white, and that he would have most likely looked like a typical Galilean Semite of his day. Among the points made was that the Bible records that Jesus's disciple Judas had to point him out to those arresting him. The implied argument is that if Jesus's physical appearance had differed markedly from his disciples, then he would have been relatively easy to identify. James H. Charlesworth states Jesus' face was "most likely dark brown and sun-tanned", and his stature "may have been between five feet five [1.65 m] and five feet seven [1.70 m]". During the Middle Ages, a number of legendary images of Jesus began to appear, at times perhaps constructed to validate the styles of depiction of that period, e.g. the image of Edessa. The Veil of Veronica was accompanied by a narrative about the Passion of Jesus. A number of descriptions of Jesus have been reported by saints and mystics who claim they have seen Jesus in a vision. Reports of such visions are more common among Roman Catholics than other Christian denominations. By the 20th century, some reports of miraculous images of Jesus began to receive significant attention, e.g. Secondo Pia's photograph of the Shroud of Turin, one of the most controversial artifacts in history. During its May 2010 exposition the shroud and its photograph of what some authors consider the face of Jesus were visited by over 2 million people. Another 20th-century depiction of Jesus, namely the Divine Mercy image is based on Faustina Kowalska's reported vision, which she described in her diary as a pattern that was then painted by artists. The depiction is now widely used among Catholics, and has over 100 million followers worldwide. 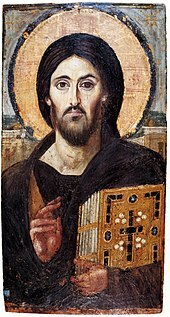 The oldest surviving Christ Pantocrator icon, 6th century, Saint Catherine's Monastery, Egypt. Despite the lack of biblical references or historical records, for two millennia a wide range of depictions of Jesus have appeared, often influenced by cultural settings, political circumstances and theological contexts. As in other Christian art, the earliest depictions date to the late second or early 3rd century, and are primarily found in Rome. In these early depictions, Jesus is usually shown as a youthful figure without a beard and with curly hair, sometimes with different features from the other men in the scenes, e.g. his disciples or the Romans. However bearded depictions also appear from very early on, perhaps drawing on an existing stereotype from the Greek world of the appearance of the many itinerant charismatic philosophers. Although some images exist at the synagogue at Dura-Europos, and such images may have been common, Judaism in theory forbade images, and its influence on the depictions of Jesus remains unknown. Christian depictions of the 3rd and 4th centuries typically focused on New Testament scenes of healings and other miracles. Following the conversion of Constantine in the 4th century, Christian art found many wealthy donors and flourished. In this period Jesus began to have more mature features, and was shown with a beard. 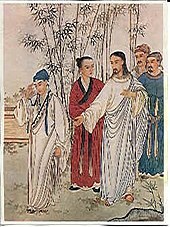 A new development at this time was the depiction of Jesus without a narrative context, but just as a figure by himself. By the 5th century depictions of the Passion began to appear, perhaps reflecting a change in the theological focus of the early Church. The 6th century Rabbula Gospels include some of the earliest images of the crucifixion and resurrection. By the 6th century the bearded depiction of Jesus had become standard, both in the East and the West. These depictions with reddish brown hair parted in the middle and with almond shaped eyes showed consistency for several centuries. At this time various legends were developed to attempt to validate the styles of depiction, e.g. the image of Edessa and later the Veil of Veronica. The Byzantine Iconoclasm acted as a barrier to developments in the East, but by the 9th century art was again permitted. The Transfiguration of Jesus was a major theme in the East and every Eastern Orthodox monk who took up iconography had to start his craft by producing the icon of the Transfiguration. Whereas Western depictions aim for proportion, the abolition of perspective and alterations in the size and proportion of an image in Eastern icons aim to reach beyond man's earthly dwellings. The 13th century witnessed a turning point in the portrayal of the powerful Kyrios image of Jesus as a wonder worker in the West, as the Franciscans began to emphasize the humility of Jesus both at his birth and his death via the Nativity scene as well as the crucifixion. The Franciscans approached both ends of this spectrum of emotions and as the joys of the Nativity were added to the agony of crucifixion a whole new range of emotions were ushered in, with wide-ranging cultural impact on the image of Jesus for centuries thereafter. The Renaissance brought forth a number of artistic masters who focused on the depictions of Jesus and after Giotto, Fra Angelico and others systematically developed uncluttered images that focused on the depiction of Jesus with an ideal human beauty. Leonardo da Vinci's The Last Supper which is considered the first work of High Renaissance art due to its high level of harmony became well known for depicting Jesus surrounded by varying emotions of the individual apostles at the announcement of the betrayal. Objections to depictions of Jesus have appeared, e.g. in 1850 John Everett Millais was attacked for his painting Christ in the House of His Parents because it was "painful" to see "the youthful Saviour" depicted as "a red-headed Jew boy". The first cinematic portrayal of Jesus was in the 1897 film La Passion du Christ produced in Paris, which lasted five minutes. Thereafter cinematic portrayals have continued to show Jesus with a beard in the standard western depiction that resembles Renaissance images. More recent artistic and cinematic portrayals have also made an effort to characterize Jesus as an ancient Middle Eastern resident. In the 2004 movie, The Passion of the Christ, Jesus was portrayed by Jim Caviezel who wore a prosthetic nose during filming and had his blue eyes digitally changed to brown to give him a more Middle Eastern appearance. According to designer Miles Teves, who created the prosthesis: "Mel (Gibson) wanted to make the actor playing Jesus, James Caviezel, look more ethnically Middle Eastern, and it was decided that we could do it best by changing the shape of his nose." ^ Revelation 1:15 commentary A symbolic description of Christ in glory. The metaphorical language is not to be understood literally. ^ Arvidsson, Stefan (June 1999). "Aryan Mythology As Science and Ideology". Journal of the American Academy of Religion. Oxford University Press. 67 (2): 327–354. doi:10.1093/jaarel/67.2.327. JSTOR 1465740. ^ a b c d e f g h Colin Kidd (2006). The Forging of Races: Race and Scripture in the Protestant Atlantic World, 1600–2000. Cambridge, UK: Cambridge University Press. ISBN 978-0-521-79324-7. ^ "What did Jesus really look like, as a Jew in 1st-century Judaea?". ^ Taylor, Joan (2015-12-24). "What did Jesus really look like?". BBC News. ^ Gibson, David (2004-02-21). "What Did Jesus Really Look Like?". The New York Times. ^ "In a forensic pilgrimage, a scholar asks, 'What did Jesus look like?'". ^ "We've been lied to: Jesus was most likely brown-eyed, muscular and short". ^ "Biblehub, Clark's commentary". Her consecrated ones were purer than snow, They were whiter than milk; They were more ruddy in body than corals, Their polishing was like lapis lazuli. ^ Robert E. Van Voorst, Jesus Outside the New Testament: An Introduction to the Ancient Evidence, Eerdmans Publishing, 2000, p.66. ^ a b c d Eisler, Robert. The Messiah Jesus and John the Baptist. London: Methuen & Co. Ltd., 1931. ^ Dobschütz, Ernst von, Christusbilder: Untersuchungen zur christlichen Legende, Leipzig, 1899. ^ The Catholic Encyclopedia, http://www.newadvent.org/fathers/0315.htm, Tertullian, On the Flesh of Christ, 9. ^ The Catholic Encyclopedia, http://www.newadvent.org/fathers/0103.htm, Irenaeus, 'Adversus haereses,' IV.XXXIII.12. ^ Barnstone, Willis. 'The Acts of John – Christ's Earthly Appearance,' in The Other Bible. New York, NY: HarperCollins Publishers, 1984, p. 417. ^ Astell, Anne W. (2006). Eating Beauty: The Eucharist and the Spiritual Arts of the Middle Ages. Cornell University Press. p. 81. ^ Tatum, W (2009). Jesus: A Brief History. p. 221. ^ Neal Robinson, Christ in Islam and Christianity, SUNY Press, 1990, p.94. ^ F. E. Peters, Reader on Classical Islam, Princeton University Press, 1993, p.189. ^ Bukhari, Kitab al-Fitn, ch. 27. ^ Bukhari, Kitabul Ahadlth al-Anbiya, Hadith 3185. ^ Bukhari, Kitabul Bad' al-Khalq, Hadlth 3000. ^ Ana Echevarría, "Eschatology Or Biography? Alfonso X, Muhammad's Ladder And A Jewish Go-Between", in Cynthia Robinson & Leyla Rouhi (eds), Under the Influence: Questioning the Comparative in Medieval Castile, Brill, Boston, 2005, p.140. ^ "Why do we think Christ was white?". London: BBC News. 27 March 2011. Retrieved 13 October 2011. ^ a b c d Wilson, Giles (27 October 2004). "So what color was Jesus?". London: BBC News. Retrieved 20 November 2011. ^ Bennett, Catherine (29 March 2001). "It's the greatest story ever told. Pity no one had a camera". The Guardian. London: Guardian Media. ISSN 0261-3077. OCLC 476290235. Retrieved 3 November 2011. ^ "This is what Jesus Christ's "selfie" would look like". ^ Wells, Matt (March 27, 2001). "Is this the real face of Jesus Christ?". The Guardian. London: Guardian. ISSN 0261-3077. OCLC 60623878. Retrieved May 12, 2011. ^ a b Legon, Jeordan (December 25, 2002). "From science and computers, a new face of Jesus". CNN. Retrieved May 12, 2011. ^ "Experts Reconstruct Face Of Jesus". London: CBS. March 27, 2001. Retrieved May 12, 2011. ^ a b c Fillon, Mike (December 7, 2002). "The Real Face Of Jesus". Popular Mechanics. San Francisco: Hearst. ISSN 0032-4558. OCLC 3643271. Retrieved May 12, 2011. ^ Charlesworth, James H. (2008). The Historical Jesus: An Essential Guide. Abingdon Press. p. 72. ISBN 978-0-687-02167-3. ^ Godwin, George, ed. (June 1, 1850). "The Royal Academy Exhiition". The Builder. London: Publishing Office. 8 (382): 255–256. Retrieved June 18, 2011. ^ Rickitt, Richard (2006). Designing Movie Creatures and Characters: Behind the Scenes With the Movie Masters (illustrated ed.). Hove: RotoVision. ISBN 978-2-940361-39-7. OCLC 475780266. Retrieved June 18, 2011. Lay summary (February 20, 2007). Ehrman, Bart D. (2004). Ehrman, Bart D. (ed.). The New Testament: a Historical Introduction to the Early Christian Writings, Part 1 (3rd, illustrated ed.). New York City: Oxford University Press. ISBN 978-0-19-515462-7. OCLC 52430805. Retrieved June 18, 2011. Glasgow, James (2010) . The Apocalypse Translated and Expounded. Edinburgh: T&T Clark. ISBN 978-1-153-28844-6. OCLC 557904029. Retrieved June 18, 2011. Mosley, William (1987). What Color Was Jesus? (1st ed.). Chicago: African American Images. ISBN 978-0-913543-09-2. OCLC 17281825. Retrieved June 18, 2011. Niehaus, Jeffrey Jay (1995). God at Sinai: Covenant and Theophany in the Bible and Ancient Near East. Studies in Old Testament Biblical Theology. Grand Rapids, Michigan: Zondervan. ISBN 978-0-310-49471-3. OCLC 31434584. Retrieved June 18, 2011. Rodriguez, Clara E. (2000). Changing Race: Latinos, the Census, and the History of Ethnicity in the United States. Critical America (illustrated ed.). New York City: New York University Press. ISBN 978-0-8147-7547-9. OCLC 43684476. Retrieved June 18, 2011. York, Malachi Z. (1993). What Race Was Jesus?. Egipt. ISBN 978-1-59517-030-9. Retrieved June 18, 2011. Lay summary (2004).